Boy, this last week has been crazy! The painters came last Thursday to paint the basement/sewing area, so everything needed to be moved. Now the walls are a nice neutral gray instead of an ugly green, but I needed to wait two days for the paint to cure before I could return everything to its rightful place. So yesterday and today have been busy putting fabric, bins and thread away. However I did manage to complete a couple of small projects. First the Mini-Lotus (20 1/4″ x 20 3/4″) is finished. 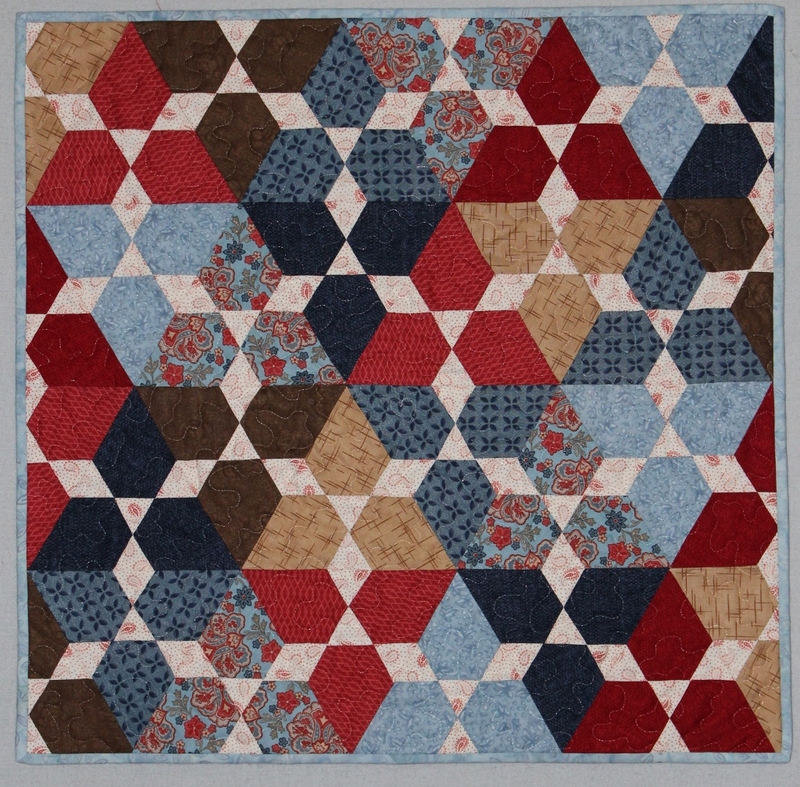 I really like the light rings of triangles & diamonds that run through the quilt. This one is a Christmas gift, but I plan to make another one for me. The colorway will be gray background fabrics with red triangles & diamonds. The second project was two tumbler pillowcases to go with the Tumbler quilt. Originally I wanted the main part of the pillowcases to be the light background fabric with two rows of dark tumbler blocks. But after finishing the Tumbler quilt there was only 9″ of the background fabric remaining, so I decided to reverse the color selection. Now that I see them on the bed, I think that this turned out for the best – the black fabric contrasts nicely against the Tumblers. Check out what everyone else is working on at Judy’s Design Wall Monday while I go back to reorganizing my stash. I like the rings in the mini-lotus, too. You did a great job matching everything up! Thank you – the pattern is easier to make than it appears. I love the bright colours in your tumbler blocks. I just bought the mini lotus pattern and it is on my list to make soon – love yours. 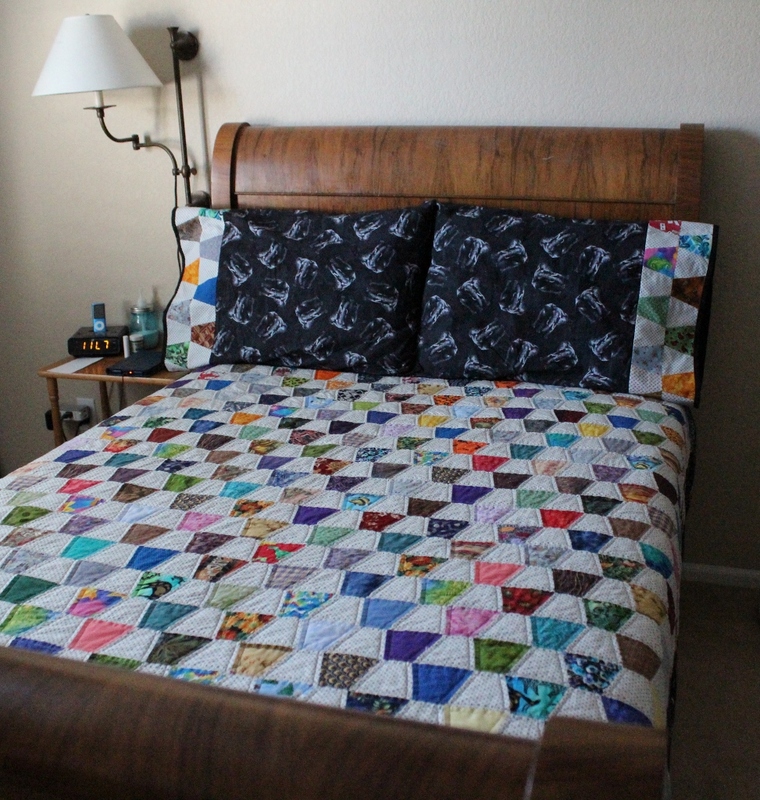 Very pretty tumbler quilt on the bed too.